After I broke my Scottish cheese duck last week with Caboc, I’m on a roll as this week’s cheese also hails from north of the border (or The Borders, to be precise). But this week’s cheese could not be more different from last week’s. If Caboc is mild and inoffensive, the Balamory of Scottish cheese, Lanark Blue is – Scottish cliché alert – the Braveheart of cheeses. It’s fierce, blue and has certainly faced battle in its time. Lanark Blue is a blue, unpasteurised, ewe’s milk cheese, made originally by Humphrey Errington and now also by his daughter Selina on Walston Brahead Farm in South Lanarkshire, Scotland. Humphrey went off to university and worked in shipping before returning to Scotland and settling on the farm in 1982. To realise his dream of cheese-making and add value to his flock of Lacaune dairy sheep, he sought help from several cheese-makers and teachers and Lanark Blue went on sale in Scotland in 1985. A handmade cheese, produced in a farmhouse creamery, it was the first British ewe’s milk blue cheese for centuries. But a decade later, with the cheese perfected and a legion of fans buying it, the cheese was besieged by an enemy. Not mice. Not mites. Far worse: environmental health inspectors. In 1994, Clydesdale Council claimed to have found listeria in a sample and condemned a tonne of the cheese, worth £60,000. All of his cheese was recalled and Errington ordered to stop selling it. He was told to expect many deaths and the story broke in the papers with the headline ‘Killer Cheese.’ But Errington started to get his own tests carried out; the majority found no listeria whilst a few found traces of a non-dangerous strain. He appealed against the decision and, after a year of fighting it out in the courts, he won. His supporters and fans of his cheese were so outraged by the case that they raised £37,000 towards the legal costs. Freedom for Lanark Blue! The cheese is hand-made. Cultures – including the Penicillium roquefortii mould – are added to the milk and it’s gently warmed and stirred for an hour. Vegetarian rennet is used to set the curds; this takes less time with ewe’s milk than with cow’s milk. The curds are then cut horizontally and vertically to form small cubes and then left to ‘heal’, where the curds develop a thin film on the surface. The whey is drained away and the curds ladled into moulds and allowed to settle in a warm room. They are then turned five times in the afternoon to encourage the remaining whey to drain away, dry salted and placed on racks in a cooler room. Finally the cheese is pierced by hand with stainless steel rods to allow air to penetrate the cheeses and start the mould spreading. The cheese is turned twice a week or wrapped in foil if it’s to mature for longer. The taste of the cheese is said to vary according to the seasons; it’s more creamy and medium-flavoured in the spring but becomes strong and fierce – one cheesemonger uses the word ‘wild’ and their own website quotes someone calling it a ‘kilt-lifter’ – in the winter. My slab was certainly on the feisty side. It tasted very like a Roquefort; creamy, almost fluid in places and slightly gritty in others and veined with flashes of blue and green that fizz on your palate. My Stilton-loving Other Half declared it ‘a bit much’ for him but I thought it was great, a really interesting cheese in both flavour and history. With additional research from Food List, The Independent, Teddington Cheese and Cooks Info. Brilliant post! 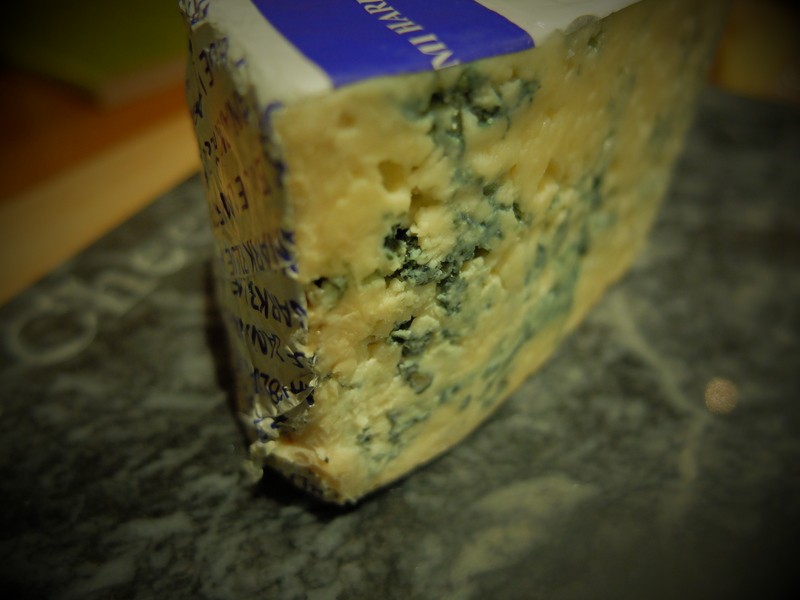 I love Lanark Blue, only wish there was some in my fridge to have this weekend….. I had to buy the world’s biggest chunk! I’m thinking of cooking up a nice soup with what remains. Kilt-lifter. Hmm, reminds me of an interview I once had to do with the then-editor of the Sun, something probably better glossed over. The cheese sounds far more appetising. I’ll look out for that one – always nice to find British alternatives to favourite French cheeses. Yikes, I’m not sure whether to be intrigued or scared. It sounds like you could sue though 😉 On a cheesier note (if there’s anything cheesier than The Sun), Crozier Blue is another nice Roquefort-esque one too. It’s a great story, but I might wait for the creamy spring version of the cheese before I even think about trying it… still don’t really get this whole blue cheese thing! Oh, you’ve made my mouth water! I doubt if I can find the Lanark Blue here in the States but I must work some Blue into this weekend’s menu! Yes, we do have some nice blues. The smoked that I used in fondue (January 12th, 2014 post) being on of my favorites. Can one every experience enough cheese? Perhaps I’ll it’s time for a cheese based vacation to Europe! This sounds like my kind of blue! Would be perfect with caramelized red onions, dried figs and perhaps a little prosciutto, on a thin crispy pizza base! Great post, lol, up until now I thought you were a bloke!…I suppose you still could be a bloke, cos my clue was that your other half is a him! Funny what conclusions our brain comes to! That’s funny, quite a few people have assumed I’m a man! Not sure what ‘manly’ qualities come through in my writing, haha! The only thing I can think of is maybe your gravatar pic put the idea I my head! And then maybe my subconscious picked up on the French for man in Homage! I didn’t realise my brain was doing all that and leading me up the wrong path! I tried to reply from my phone n doesn’t seem to have worked…I was saying that maybe your gravatar put the idea in my head and that my subconscious was picking up on the French word for man in homage! Funny what our brain does with out us realising!